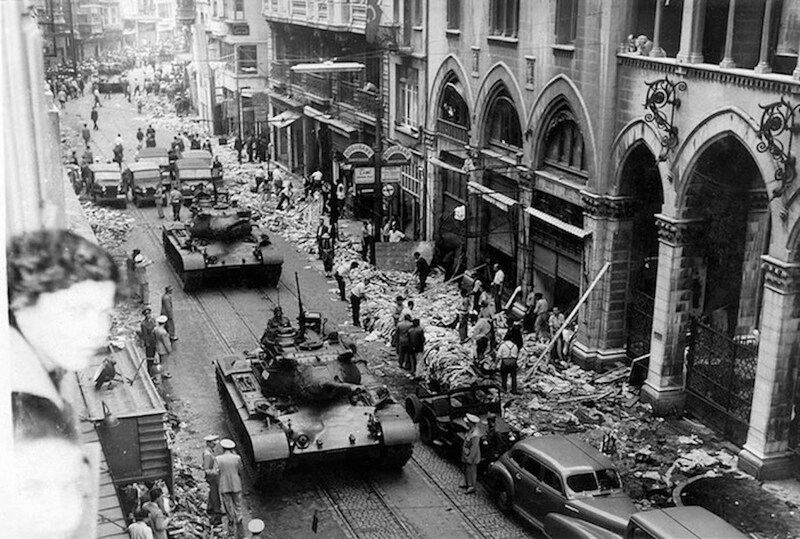 The lethal pogrom of September 6-7, 1955 delivered a fatal blow to the Greek community and Hellenism of Constantinople in seven hours. Well planned (for some years), masterfully carried out in a well organized manner by the Turkish government, the Turks destroyed 71 churches, 41 schools, 4,008 stores, the offices and printing presses of eight newspapers, and approximately 2,100 dwellings, all the property of the Greeks and their communities. The Turks killed 28 Greeks and also carried out the rapes of Greek women. They profaned and soiled the Greek Orthodox religious vessels; they smashed and dug up the graves in Greek cemeteries, throwing out the bones and remains of the dead; they effected circumcisions on some elderly priests on the streets. The incident is carefully investigated and revealed in Vryonis’ book The Mechanism of Catastrophe. Further, most are unaware that the Turkish government had unleashed the mobs on the Greek community of Istanbul, on its churches, houses, businesses, schools, and newspapers; and they are unaware that this resulted in the ultimate destruction of Turkey’s oldest historical community, about 100,000 Greek Orthodox Christians who were the heirs of Byzantium. 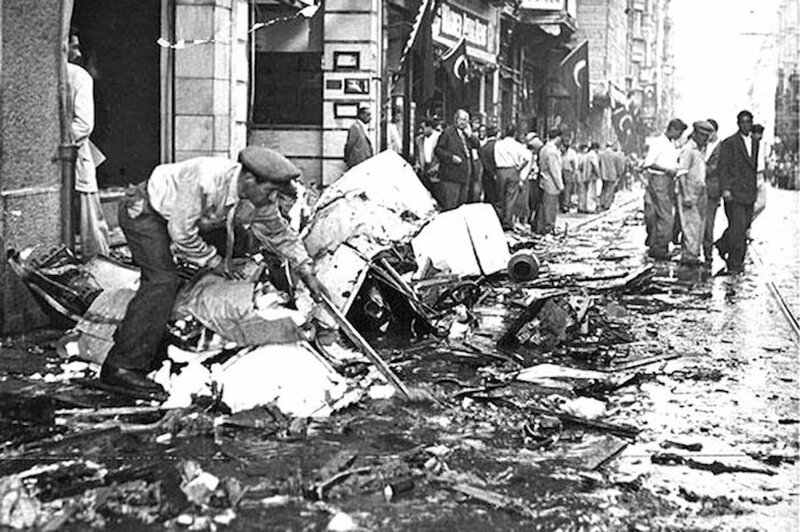 In recent years, Turkish authorities publicly released various news archives with dozens of photos that show the widespread devastation and destruction of Istanbul’s Greek community. This is an example wherein the press serves as mankind’s historical and ethical teacher. I should add that many Greeks and Greek Americans have lost their sense of history, of whence they came, of who they are, and of what they are becoming. The Turkish press, which was to play a crucial role in preparing the political atmosphere of the pogrom, received significant financial support from British sources. Specifically, the British gave financial assistance to two Turkish newspapers and to their owners/editors: to Hikmet Bil (editor of the newspaper Hurriyet and leader of the political organization Kibris Turktur – Cyprus is Turkish), and Ahmet Emin Yalmas, owner of the older Istanbul paper Vatan). Also on September 5, the Turkish prime minister’s executive council, which included the minister of the interior in charge of security, the governor of Istanbul, and the chief of police, among others, met to discuss the petition and the situation more generally. How was it possible to bring the photographs from Thessaloniki to Istanbul, develop them and publish them on the same afternoon, in a day and age when there were no airplane flights between Thessaloniki and Istanbul, and at a time when the bus would not have arrived in Istanbul until well into the night? First, the Turkish consul had left his post for Istanbul long before the event in question, leaving behind his wife to take care of “last minute details” before departing herself to join her husband. Among these “last minute detail”,’ she was to telephone a photographic studio in Thessaloniki to hire a Greek photographer to photograph the inside of the walled complex of the Turkish consulate. A few days before the explosion of the bomb, she departed with the photographs for Istanbul. However, the original photographs had been tampered with and had been altered to show purported damage to the house of Ataturk – all this before the actual explosion of the bomb. Thus, the Thessaloniki police could compare the photographic “evidence” published in the afternoon edition of the Istanbul Express on September 6 and identify it with the photos produced by the Greek photographer, and to show, on the basis of their investigation, that the Turkish version of the explosion had been falsified. This official report was written by a diplomat who had served as consul general during the events in question, and who was appointed by the Greek Foreign Office to make an investigation and report to the ministry. The document impresses with its wealth of information as well as by the objectivity of the analytical nature of its perceptions. The execution of the plan [for the pogrom] reveals two basic characteristics: (1) A well-effected and harmonized time schedule of actions, and (2) effective coordination. 4:00 p.m., a special supplement of the newspaper Istanbul Express circulates, publishing this ‘news’ and featuring an artificially altered photograph of the purported destruction of the house [of Ataturk]. 7:00 p.m., there commences the smashing of display windows and iron doors of the Greek shops on Taxim Square and of the shops on Pera Street. Almost simultaneously, acts of violence begin to be manifested in the remaining neighborhoods and suburbs, so that, within two hours, the attack on and destruction of Greek property has become general and widespread through the enormous territorial triangle formed by the east tip of the Bosphoros-Sariyar and Yeni Mahalle – as far as the Propontis- St. Stephan and the Isles. In other words, this historic Greek community which had lived and created in the city on the Bosphorus from its first foundation in 668 B.C. up to 1955, for some 2,623 years (some 104 generations), suffered a complete and destructive catastrophe in only seven hours. 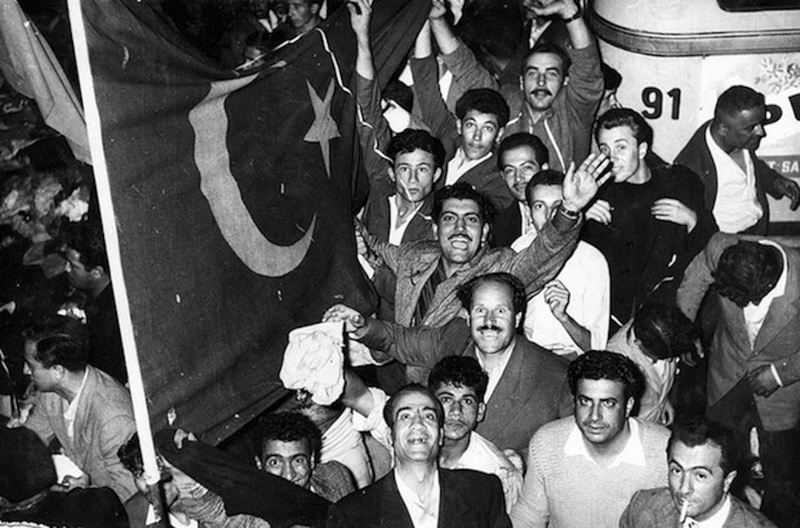 No one moved even so much as one finger to save this most historic Greek diaspora community, neither Greek nor Christian, nor so-called civilized man or woman, and certainly not the Turkish government or the Turkish nation. 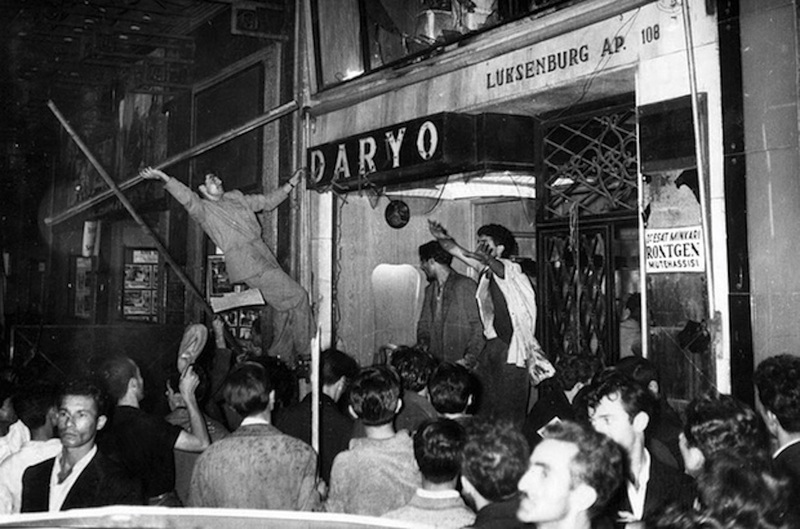 “A survey of the damage inflicted on public establishments of the Greek Community of Istanbul during the rioting on the night of September 6-7 shows that the destruction caused has been extremely widespread. In fact, only a very small percentage of community property appears to have escaped molestation. Although there are as yet no figures available assessing the damage sustained, the number of establishments attacked and the nature of the destruction caused in the course of the night under reference convey a clear picture of the scope of the devastation. In most cases the assault on these establishments involved a thorough wrecking of installations furniture, equipment, desecration of holy shrines and relics, and looting. In certain instances serious damage was inflicted on the buildings themselves by fire. 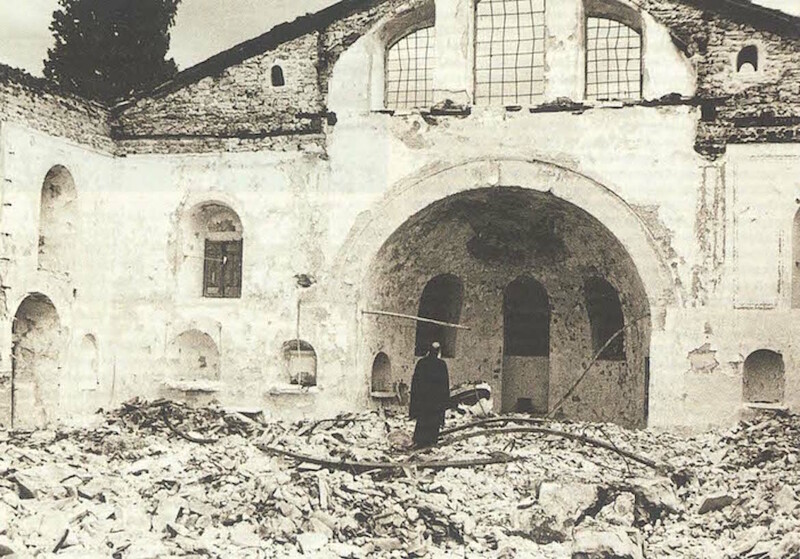 Among the Greek churches heavily attacked also figures the church of the Greek Catholic Uniate at Hamal Bapi, Beyoglu. Report has it that the presbytery of the said church and the congregational school attached thereto were also severely damaged. Extensive damage also seems to have been suffered by the educational establishments of the Greek community. At least 36 of the 48 schools of the community are reported to have been more or less seriously damaged. The principal victims are the Zappeion Girls’ College at Taksim and the Megali Scholi Boys’ College of Phanar, both princes of the community, the Theological School at Heybeli, and the high schools at Haskoy, Edirne Kapu, Bakirkoy, Gelata, Taksim and Arnavutkoy. Though not specifically community property, it might be appropriate to consider in the present report also the damage sustained by the Greek language press of Istanbul. All three principal dailies, the Apoyevmatini, the Tachydromos, and the Embros suffered heavy losses. The first two had both their offices and printing establishments completely wrecked. In the case of the Embros only its offices were destroyed since it had no printing press of its own. The Apoyevmatini (circulation 10,000), the most heavily hit, managed to resume publication two weeks after the rioting. Its losses alone are estimated at half a million lirae. The Tachydromos (circulation 5,000) has as yet not been able to recuperate from the blow but is scheduled to appear in the near future. The Embros (circulation 7,000) reappeared a few days after the disturbances. The weekly Okroids (circulation 5,000) managed to continue publication without interruption though its offices were also heavily wrecked. Like the Embros it has no printing press of its own. As pointed out in the opening paragraphs of this report, a monetary assessment of the damage caused to Greek Community property in the course of the September 6 riot has as yet not been attempted. Very general estimates on the part of community and church leaders would indicate that it goes into millions of Turkish liras. The Department will be informed as soon as a substantive estimate is available. The Turkish government, press, and nation “justified” this savagery on the false pretext that the Greeks had bombed the house of Ataturk in Thessaloniki. In reality the Greeks had not placed the bomb in the Turkish consular complex in that city on September 6. It had been put there by a Turk, in collusion with the Turkish government, in order to provide the pretext for a carefully laid plan to destroy the houses, the businesses, the property, the churches, the schools, the newspapers of the Greeks in Constantinople. It was a “logical” sequence (in Turkish minds) to the oppressive Valik Vergisi of 1942-1943, a Turkish confiscatory law which destroyed the economic bases of the Greek, Turkish and other minority communities. 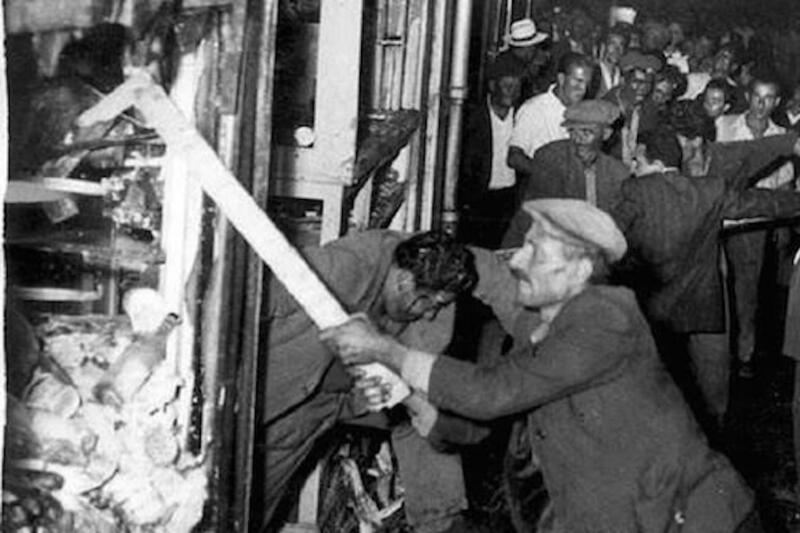 The pogrom of 1955 was a Turkish “success” as it finally destroyed the ancient Hellenism of Constantinople, both in physical and psychological dimensions. RIGHT UP TO THE BLACK SEA + GET THAT RUSSIAN PIPE GOING WITHOUT TURKISH RULE! WE CAN’T,HOWEVER I’M SURE WITH RUSSIA WE CAN BLOT ERM CRIMINALS OUT,NO SWEAT!!! My mother was a child, and lived there with my Yiayia. They witnessed this horrific event, looking from their window.